LONG SAULT, Ont. – Two volunteers who returned to help Woodland Villa team members with this year’s Country Fair say the enjoyment residents and guests experience at the event is what keeps them coming back. 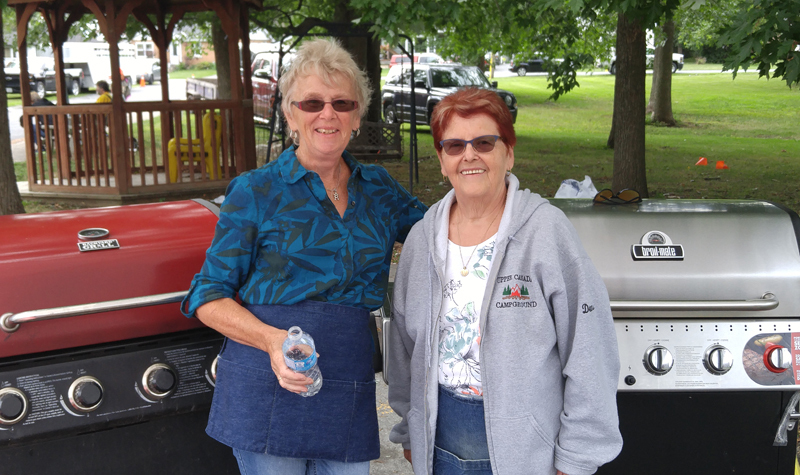 Neighbours Denise Legault and Mary Lalonde were helping the team at the Long Sault long-term care home grill burgers and hot dogs once again at this year’s Country Fair. This was the third year Denise has volunteered at the Country Fair, which was held at Woodland Villa on Aug. 22. Denise notes that the day may have been overcast, but the clouds didn’t hamper the spirit of the event. “You see everyone smile and it makes your day. It’s cloudy out today but the sun shines anyway,” she says. This was Mary’s second year volunteering at the Country Fair, which has become Woodland Villa’s flagship annual event. “I just love doing this; meeting new people, helping out – it’s a blast,” she says. Both Denise and Mary live on the same street as Woodland Villa life enrichment co-ordinator Lisa Doran, who recruited the pair as volunteers. Both Mary and Denise say they will back next year. The Woodland Villa Country Fair, which celebrated its 13th year, attracted several local vendors who sold their wares at booths. There was musical entertainment, horse and pony rides, classic cars on display, and bouncy castles for young children. The event also featured a silent auction, raffles and a 50-50 draw. The Country Fair ran from 10 a.m. to 3 p.m.